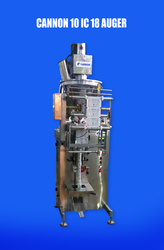 machine to pack “Powder” in laminated Poly Pouches. 05. Film Thickness : 60 – 80 microns. 07. Sealer heating system : Continues. 09. Inner Core Dia. of Film Roll : 70 mm. 10. Outer Dia. of the film Roll : up to 350 mm. 11. Pouch Style : Center Seal. 13. Pouch Length : Up to 190. 14. Power Consumption : 3 KW / Hour. 15. Peak Power : 1.5 kW. 17. Pouch Counter : Provided. 19. Batch Coding : Optional. 21. Machine Dimensions : 1800 (H) x 800 (W) x 1400 (Depth) mm. 22. Net Weight : 450kgs (approx).